I’m a visual specialist. My music knowledge is as shallow as my art background is deep. Sure, I took piano lessons as a kid. But after I learned to play Debussy’s “Clair de Lune” well enough to impress my father, I lost interest. Like a lot of people, I’ve accumulated a “personal soundtrack” based on haphazard exposure to radio stations, TV, advertising jingles, movies and live performances. Unlike most, my personal soundtrack hasn’t been transferred to an MP3 player. It resides solely between my ears, where snippets of Bach’s “Goldberg Variations” bubble up through layers of B. B. King, the “Dr. Zhivago” soundtrack and Alka Seltzer’s “Plop, plop, fizz, fizz” jingle. Combinations of Blues, Jazz, Swing and Bluegrass reside there, too, which explains why I loved Lyle Lovett (and his big band) long before he married Julia Roberts. But who knew there was so much more going on in sonic arenas beyond my own reality? Sure, everyone and their mother is wearing ear buds, listening to iPods, twiddling their cell phones and building play lists on Facebook while slumped over their laptops. But music has always been central to people’s lives, right? This isn’t any different, is it? Well, it is quite different—seismically different. And it goes far beyond mere fascination with digital gadgets. It’s not gadgetry; it’s technology. It’s portable audio environments. It’s listener authorship. In my own defense, I haven’t been immune to the music of my time. Growing up in America, in the 1950s and 60s, I heard a lot of great music: the Everly Brothers, Elvis Presley, The Supremes, Marvin Gaye, Bob Dylan, the Beatles, the Rolling Stones, Simon and Garfunkle. Since then I’ve paid attention to performers like Tom Petty, Annie Lennox, Sting, David Byrne, Moby, Beck, REM and Amy Winehouse (too bad she’s going down the drink). They’re all pretty mainstream, right? (From what I’m reading, its all becoming mainstream and that might not be a bad thing.) I’ve only tuned in to truly original music/sound works by accident, usually while flipping past obscure (to me) radio stations on my car radio. I’ve been an unconscious listener. I’ve not thought deeply about the possible correlations between my audio experiences and my understanding of graphic design, art history and art movements. With one exception: music videos. I’ve followed mainstream music videos since they first started appearing on TV—or should I say MTV? When “Whip It” by Devo came out in 1980, it just hypnotized me. The lyrics and images were so bizarre…but it had a catchy beat! Another early favorite was “Money for Nothing,” by Dire Straits (1985). Since those early days of music videos I’ve been blown away by the evolving technical and creative choices made by smart directors and sound artists. Consider the use of visual narrative as a counterpoint to the audio narrative—or the experiments with image texture and special color palettes; the elaborate dance numbers, the likes of which we haven’t seen since the Busby Burkeley films; the radical animation techniques, special effects and popular culture references. And the staging! Music videos have plundered the rich history of packaged entertainment, from the circus arena to the Medieval carnivale, from the Parisian night club to the South African dance club. For the most original physical and virtual environments, you need look no further than the music videos of Beck and Gorillaz. Music videos have given me a way in to popular contemporary sound experiments. The sophisticated use of sound mixing, video montage and animated representations of old-time paper collage clearly owe a debt to Suprematism, dada, Surrealism, Constructivism, New York School abstraction and 1960s “happenings,” not to mention Disney. Music videos draw liberally on the imagery, characters and comic timing of American TV, as well as on the iconic imagery of historic figures and events (Billy Joel’s “We Didn’t Start the Fire”). I love them all: Peter Gabriels’ “Sledge Hammer” (1986), Michael Jackson’s “Thriller” (1982), Missy Elliot’s “Supa Dupa Fly [The Rain]” (1997), Talking Head’s “Wild Wild Life” (1986), Christopher Walken “fly” moves in Fatboy Slim’s “Weapon of Choice” (2000) and OK Go’s treadmill dance on the music video “Here It Goes Again” (2006). I may be better prepared than I had thought to explore the world of audio environments, “noise” compositions and sound walks. For instance, my art practice revolves around quoting, altering and reinterpreting a highly idiosyncratic mix of signs, symbols and forms drawn from the classic canon of Western fine art, popular culture, commercial design and my personal history. I trace, scan, cut, tear, paste and plunder my way to fresh connections, significations and forms. Plundering and restoration have become the subject, as well as the practice, of my art. The destructive/creative dichotomy originally represented the trauma and incomplete redemption found in surviving insults to the body and psyche in a culture that is fundamentally hostile to women. Now I see my prints and paintings as flags of creative renewal. This, more than anything, connects me to the sound makers of the 20th and 21st century. They, too, have forged their work in the crucible of social change and political upheaval, creating hybrid practices that rupture accepted boundaries and create new territories. I think I can relate to that. 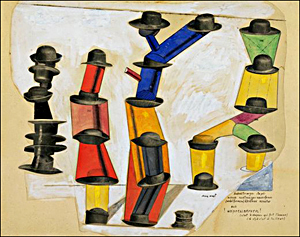 Image credit: The Hat Makes the Man, by Max Ernst. The drawing reads like a sartorial musical notation system! A very knowing—even hip—posting! You have synthesized your readings, experiences and influences to construct a coherent representation of the exciting transformations that are galvanized you. Thank you for the news from the front of the culture wars.